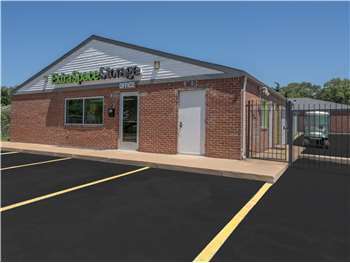 Located at the corner of Halls Ferry Rd and St Cyr Rd, Extra Space Storage serves St. Louis residents near Jennings, Ferguson, and more. Locals will recognize our facility near MMC Auto Group a few minutes west of Shop 'n Save. With a large selection of storage units, drive-up access, exceptional security, and more, Extra Space Storage on Halls Ferry Rd is the solution for you in Jennings! Storage units at our Jennings storage facility are available as small as 50 square feet and as large as 300 square feet, so we can handle a variety of residential and commercial storage needs. Every storage unit at this location comes with drive-up access. Customers love the convenience of being able to pull directly up to their storage unit to unload and load their belongings without hassle. Drive-up units can also be used for storing vehicles, such as cars, motorcycles, and small trailers. Our Halls Ferry Rd storage facility utilizes electronic gate access and 24-hour video surveillance to ensure the safety of our customers and their belongings. What makes Extra Space Storage your best self storage option? It's our friendly, professional staff! Our team genuinely cares about providing you with an incredible self storage experience and will help in any way possible to make sure you get what you need. Contact us today to reserve a storage unit in Jennings! I recommend for your storage needs. The staff was friendly and helpful. It was very easy to use after the staff demonstrated how to use the storage unit. Make sure you have extra money when going in for your first time. Ended up paying an extra amount than told over the phone. The units are clean and facility is well gated. Good customer service in person. I think that Extra Space Storage is one of the nicest storage facility I have ever used. The staff was very professional and at the same time very pleasing. The location is just off a main street and not stuck back in a hole and for a storage facility, it is very clean and well maintained. Highly recommended. Great service at an excellent price. Thank you for the wonderful workers. They have help me out a few more time than normal I believe. Thank you. Upon walking into this facility, I felt right at home. All of my questions were answered even before they were asked. We are extremely happy with everyone and everything here. The manager original Manager Eric and the New Manager Patrick are so helpful. So too are the associates. They go out of their way to help. this got a little complicated one with me and the ex-misses and they were calmly able to diffuse the situation and get things corrected very seamlessly. I would recommend to anyone with storage needs and there rates by far are the best in the area, the facility is well secured and always clean. From Interstate 70- exit at Jennings Sta Rd and go north on Jennings Sta. Rd. for approximately three miles to New Halls Ferry Road. Turn left- west on Halls Ferry Rd. and travel approxiately three blocks. Extra Space Storage is on the right side of the road. Our address is 9702 Halls Ferry Road. From Interstate 70- take Lucus & Hunt Road north to Halls Ferry Road and turn right on Halls Ferry Rd. Travel approximatel 1/2 block passing the post office on the left.Extra Space is on the left side of the road on the corn of Halls ferry Rd @ St. Cyr. Our address is 9702 Halls Ferry Road. From Hwy 270 @ Lewis and Clark Rd. Travel south on Lewis and Clark at the 3rd stop sign (St. Cyr theres a Shop and Save Grocery Store on the corner) turn right and travel over the hill Extra Space Storage is on the other side of the hill. Our address is 9702 Halls Ferry Road.